Is there an objective world, or is everything relative? Do matter, time and space change, or do they remain constant everywhere in the universe? Is there always a relationship between cause and effect, or do some things "just happen?" Many of our basic ideas about the world have been shaped by science--but seldom are such discoveries accepted easily or willingly. Here are seven of the most important ideas in physics--ideas that shattered the assumptions of dogmatists, philosophers and scientists--explained simply and elegantly. And you don't need a background in mathematics or science to enjoy this fascinating book. 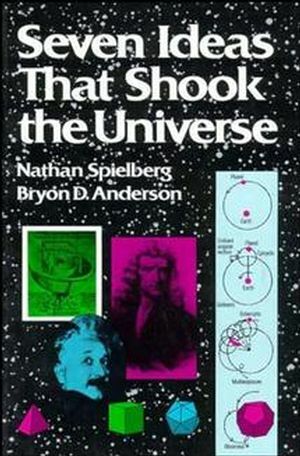 Seven Ideas That Shook the Universe explores the history of seven important themes in physics: Copernican astronomy, Newtonian mechanics, energy and entropy, relativity, quantum theory, and conservation principles and symmetries. Together these discoveries form the foundation of our understanding of the physical world. Nathan Spielberg and Bryon Anderson explain each concept in a simple, straightforward narrative style, considering each in the context of its times and assessing its impact on the way we think about time, space, matter, even existence itself. For the science lover and the intellectually curious, Seven Ideas That Shook the Universe brings the drama of scientific discovery to vivid life. NATHAN SPIELBERG and BRYON D. ANDERSON are physics professors at Kent State University. Science and Other Areas of Human Endeavor: Distinctions andSimilarities. Early Scientific Stirrings in the Mediterranean Area. Geocentric Theory of the Universe. The Heliocentric Theory: Revival by Copernicus. New Data and a New Theory. The Natural Flow of Heat. Transformation of Heat Energy into Other Forms of Energy. Attempts to Detect the Ether. QUANTUM THEORY AND THE END OF CAUSALITY. The Nuclear Atom and Atomic Spectra. The Use of Models in Describing Nature. The Impact of Quantum Theory on Philosophy and Literature. The Nuclear Force and Nuclear Structure.